PMC quit developing for ArmA 2 and moves into ArmA 3. More details from our forum PMC will quit developing for ArmA 2 post. Thu, 08 Dec 2016 19:22:00 +0000 - Vietnam: The Experience v1.6 has been released! Vietnam: The Experience v1.6 has been released! Official VTE ArmA 2 Homepage and PMC Addons/Mods Manuals: VTE ArmA 2 and PMC Tactical forum VTE v1.6 release topic. Sat, 22 Oct 2016 02:59:06 +0100 - PMC 51km Desert v1.9.2 has been released! Download from PMC Tactical ArmA 2 Downloads, check out PMC Tactical Forums Release topic at our forum and read PMC Addons/Mods Online Manuals: PMC 51km Desert. Enjoy. Sat, 22 Oct 2016 02:31:25 +0100 - PMC Terrain Objects v1.8 has been released! Download from PMC Tactical ArmA 2 Downloads, check out PMC Tactical Forums Release topic at our forum and read PMC Addons/Mods Online Manuals: PMC Terrain Objects. Enjoy. Fri, 21 Oct 2016 05:29:55 +0100 - PMC AGS Port v1.9 has been released! Download from PMC Tactical ArmA 2 Downloads, check out PMC Tactical Forums Release topic at our forum and read PMC Addons/Mods Online Manuals: title. Enjoy. Original PMC Skybox Remove v1.1 release was missing a server bikey. I have just done REPACK release with bikey included. Nothing has changed in the addon itself so if you already downloaded v1.1 the only difference in REPACK release is the included bikey file. If you are regular PMC addon user, you should already have "PMC2.bikey" anyways. Wed, 19 Oct 2016 08:54:35 +0100 - PMC Rugen v1.5 has been released! This is PMC Rugen terrain addon from OFP, ported to work in ArmA and now ArmA 2 CO. This is european Everon & Nogova themed terrain of 25km x 25km size, there is roads, airbase, airstrip, several industrial sites, harbors, cities, villages and two army bases. Tue, 18 Oct 2016 08:30:59 +0100 - PMC Editing Wiki moved to a new domain! Fri, 14 Oct 2016 23:37:33 +0100 - PMC AGS Industrial v1.6 has been released! This is AGS Industrial Pack addon from OFP, now ported to work in ArmA 2. These models can be used from mission editor, or placed in WRP terrains directly. Download from PMC Tactical ArmA 2 Downloads, check out PMC Tactical Forums Release topic at our forum and read PMC Addons/Mods Online Manuals: PMC AGS Industrial. Enjoy. Tue, 11 Oct 2016 22:23:35 +0100 - PMC Rattler v1.9.2 has been released! This is PMC Rattler terrain addon from OFP, now ported to work in ArmA 2 CO. This is desert terrain of 25km x 25km size, there is roads, airbase, airstrip, several oilfields, army bases, harbors and war torn ruined cities. Download from PMC Tactical ArmA 2 Downloads, check out PMC Tactical Forums Release topic at our forum and read PMC Addons/Mods Online Manuals: PMC Rattler. Enjoy. Wed, 05 Oct 2016 17:19:29 +0100 - PMC AGS Buildings v1.5 has been released! These are the good old Agent Smith (AGS) buildings from OFP ported to ArmA and now ArmA 2. It includes merged textures, reduced section counts and optimized models. This is high performance building pack. These models can be used from mission editor, or placed in WRP terrains directly. Download from PMC Tactical ArmA 2 Downloads, check out PMC Tactical Forums Release topic at our forum and read PMC Addons/Mods Online Manuals: AGS Buildings. Enjoy. Mon, 03 Oct 2016 11:51:01 +0100 - PMC Terrain Objects v1.7 has been released! Sat, 01 Oct 2016 06:09:08 +0100 - PMC Skybox Remove v1.1 has been released! PMC Skybox Remove v1.1 has been released! This is skybox remove addon which can be used to remove the ugly, unfitting and unrealistic chernarus mountains from all terrains. Purpose of this addon is to provide unified no skybox addon for PMC 51km Desert, PMC Rattler, PMC Rugen and other terrain addons. Download from PMC Tactical ArmA 2 Downloads, check out PMC Tactical Forums Release topic at our forum and read PMC Addons/Mods Online Manuals: PMC Skybox Remove. Enjoy. Thu, 18 Sep 2014 00:44:47 +0100 - PMC Somalia v0.7 has been released! PMC Somalia v0.7 has been released! Read more info from PMC Somalia ArmA 2 homepage like manual and download links. Sat, 15 Jun 2013 23:58:25 +0100 - PMC CDF Command v0.1.4 has been released! PMC CDF Command v0.1.4, multiplayer mission pack (campaign) released! More details from PMC Tactical Forums Official Release Topic and PMC Addons/Mods Manuals: PMC CDF Command. Enjoy. Fri, 14 Jun 2013 03:06:53 +0100 - PMC 51km Desert v1.9 has been released! This is 51km x 51km desert terrain with war torn cities and villages. There is also few modern (intact) cities, three airbases, six oilfields and six harbors. Changes are lot of vegetation removed from city roads, harbor 6 added and lot of others (see changelog). Check out PMC Tactical Forums Release topic at our forum and read PMC Addons/Mods Manuals: PMC 51km Desert. Enjoy. 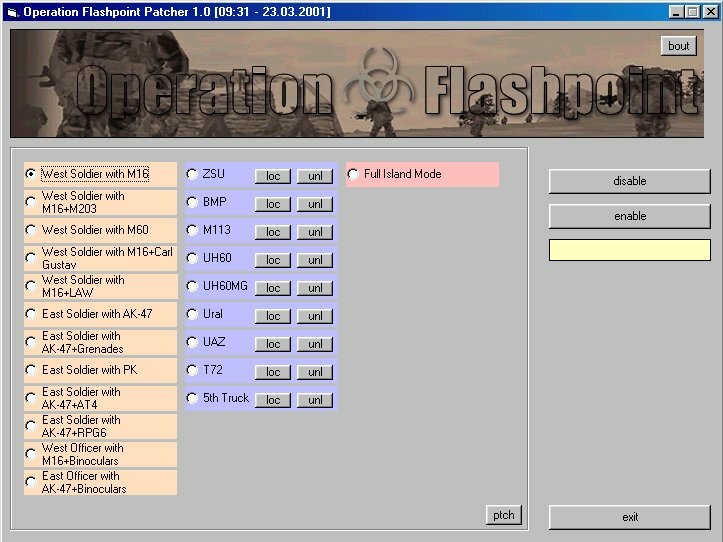 Mon, 10 Jun 2013 12:34:56 +0100 - PMC Militia Attack v0.1.9 mission pack released! PMC Militia Attack, multiplayer mission pack v0.1.9! More details from PMC Tactical Forums Official Release Topic and PMC Addons/Mods Manuals: PMC Militia Attack. Enjoy. Fri, 07 Jun 2013 17:29:14 +0100 - PMC Rugen v1.4 has been released! PMC Rugen v1.4 has been released! for ArmA 2 CO! This is ArmA 2 port of legendary terrain from OFP, it includes all the latest goodies like precise satellite texture according to OFP textures, etc. Check it out from PMC Rugen ArmA 2 release topic at our forum and PMC Addons/Mods Manuals: ArmA 2 PMC Rugen. Enjoy. Fri, 07 Jun 2013 17:09:57 +0100 - PMC Rattler v1.9.1 has been released! PMC Rattler v1.9.1 has been released! Its a 25km desert terrain for ArmA 2 Combined Operations. Changes are switched to use new PMC Terrain Objects pack. Check it out from PMC Rattler Official Release topic at our forum and PMC Addons/Mods Manuals: PMC Rattler. Enjoy. Fri, 07 Jun 2013 16:52:58 +0100 - PMC 51km Desert v1.8.1 has been released! This is 51km x 51km desert terrain with war torn cities and villages. There is also few modern (intact) cities, three airbases, six oilfields and five harbors. Check out PMC Tactical Forums Release topic at our forum and read PMC Addons/Mods Manuals: PMC 51km Desert. Enjoy. Fri, 07 Jun 2013 16:40:06 +0100 - PMC Terrain Objects v1.6 has been released! PMC Terrain Objects v1.6 has been released! This is terrain objects which can be used in WRP files or placed from mission editor. Purpose of this addon is to provide unified objects addon for PMC 51km Desert, PMC Rattler and PMC Rugen terrain addons (and in future perhaps others). Check out PMC Tactical Official Release topic at our forum and read PMC Addons/Mods Manuals: PMC Terrain Objects. Enjoy. Sat, 01 Jun 2013 06:46:44 +0100 - PMC Persistent 1 v0.3.2 has been released! PMC Persistent 1, multiplayer mission updated to v0.3.2! More details from PMC Tactical Forums Official Release Topic and PMC Addons/Mods Online Manuals: PMC Persistent 1. Enjoy. Tue, 28 May 2013 09:09:58 +0100 - PMC Electric Road v1.0.1 released! PMC Electric Road, multiplayer mission pack (campaign) updated to v1.0.1! More details from PMC Tactical Forums Official Release Topic and PMC Addons/Mods Online Manuals: PMC Electric Road. Enjoy. Sun, 26 May 2013 07:41:43 +0100 - PMC Somalia v0.6 has been released! This is Somalia conflict mod featuring realistic Mogadishu terrain, 1993 era US Army Rangers, Delta Force, Navy SEALs, 160th SOAR pilots plus littlebirds, black hawks, ah1 cobra, hmmwv, 5 ton trucks and Somali militia / civilians. See also PMC Somalia ArmA 2 Homepage. Check out PMC Tactical Forums Release topic at our forum and read PMC Addons/Mods Online Manuals: PMC Somalia. Enjoy. Wed, 15 May 2013 15:52:51 +0100 - PMC 51km Desert v1.8 has been released! Changes are satellite map detail increased, proper map names added, cfgsurface speeds adjusted, etc. Check out PMC Tactical Forums Release topic at our forum and read PMC Addons/Mods Online Manuals: PMC 51km Desert. Enjoy. Wed, 15 May 2013 15:51:45 +0100 - PMC Terrain Clutter v1.6 has been released! This is terrain clutter which can be used in WRP files (only useful for terrain editors). Purpose of this addon is to provide unified clutter addon for PMC 51km Desert, PMC Rattler and PMC Rugen terrain addons (and in future perhaps others). Check out PMC Terrain Clutter release topic at our forum and PMC Addons/Mods Online Manuals: PMC Terrain Clutter. Enjoy. Wed, 15 May 2013 15:50:31 +0100 - PMC Skybox Remove v1.0 has been released! This is skybox remove addon which can be used to remove the ugly, unfitting and unrealistic chernarus mountains from all terrains. Purpose of this addon is to provide unified no skybox addon for PMC 51km Desert, PMC Rattler and PMC Rugen terrain addons (and in future perhaps others). Check out PMC Tactical Forums Release topic at our forum and read PMC Addons/Mods Online Manuals: PMC Skybox Remove. Enjoy. Fri, 26 Apr 2013 10:32:11 +0100 - VTE v1.5.25 Upgrade has been released! Vietnam: The Experience v1.5.25 upgrade has been released! Check it out from VTE Homepage. Enjoy. Tue, 23 Apr 2013 08:30:27 +0100 - PMC 51km Desert v1.7 has been released! PMC 51km Desert v1.7 has been released! This is 51km x 51km desert terrain with war torn cities and villages. There is also few modern (intact) cities, three airbases, six oilfields and five harbors. Wed, 28 Nov 2012 18:38:13 +0000 - Vietnam: The Experience v1.5 has been released! PMC has released Vietnam: The Experience v1.5 for ArmA 2! Too many changes to list, check changelog for details. Check it out from PMC Tactical Forums VTE Official Release Topic and online manual from here. Enjoy. Vietnam: The Experience (VTE) multiplayer event on Friday October 19th, 2012. Read official event discussion topic in PMC Tactical forums for more details. New Vietnam: The Experience screenshots has been added to VTE ArmA 2 Screenshots page from our August Multiplayer missions. Enjoy. Sat, 22 Sep 2012 00:16:30 +0100 - PMC Ulah-Yuryakh v1.0 has been released! PMC has released PMC Ulah-Yuryakh v1.0! Its a 40km terrain for ArmA 2. Russian wilderness somewhere in Siberia. Check it out from PMC Ulah-Yuryakh Official Release topic at our forum and PMC Addons/Mods Online Manuals: PMC Ulah-Yuryakh. Enjoy. Sat, 08 Sep 2012 06:30:27 +0100 - PMC Rattler v1.9 has been released! PMC has released PMC Rattler v1.9! Its a 25km desert terrain for ArmA 2. New features are harbor objects aligned properly, roads added to bases and oil fields. Check it out from PMC Rattler Official Release topic at our forum and PMC Addons/Mods Online Manuals: PMC Rattler. Enjoy. Thu, 06 Sep 2012 06:10:12 +0100 - PMC AGS Industrial v1.5 has been released! PMC AGS Industrial v1.5 for ArmA 2 has been released! New feature is oilwell object new modeling parts (not just alpha channel anymore). Read PMC Tactical Official Release topic and PMC Addons/Mods Online Manuals: AGS Industrial. Enjoy. Tue, 31 Jul 2012 07:05:38 +0100 - PMC Rattler v1.8 has been released! PMC has released PMC Rattler v1.8! Its a 25km desert terrain for ArmA 2. New features are increased terrain / satellite texture details, ambient civilian modules support added. Sun, 29 Jul 2012 14:03:02 +0100 - PMC 51km Desert v1.6 has been released! PMC 51km Desert v1.6 has been released! This is 51km x 51km desert terrain with war torn cities and villages. There is also few modern (intact) cities, three airbases, six oilfields and five harbors. New features are roads painted in sat texture, clutter added, ocean made deeper, ambient wildlife added. Sun, 29 Jul 2012 13:50:31 +0100 - PMC Terrain Objects v1.5 has been released! PMC Terrain Objects v1.5 has been released! This is terrain objects which can be used in WRP files or placed from mission editor. Purpose of this addon is to provide unified objects addon for PMC 51km Desert and PMC Rattler terrain addons (and in future perhaps others). Check out PMC Tactical Official Release topic at our forum and read PMC Addons/Mods Online Manuals: PMC Terrain Objects. Enjoy. Sun, 29 Jul 2012 13:42:12 +0100 - PMC Terrain Clutter v1.5 has been released! PMC Terrain Clutter v1.5 has been released! This is terrain clutter which can be used in WRP files (only useful for terrain editors). Purpose of this addon is to provide unified clutter addon for PMC 51km Desert, PMC Rattler and PMC Rugen terrain addons (and in future perhaps others). Sun, 29 Jul 2012 13:28:37 +0100 - PMC AGS Port v1.8 has been released! PMC AGS Harbor / Port v1.8 has been released! New features are mod.cpp + image added and ambient civilians vehicle module fixed. Check it out from PMC AGS v1.8 has been released! topic at our forum and read PMC Addons/Mods Online Manuals; AGS Port. Enjoy. 40km Technology demonstration terrain. Not a "real" terrain addon, randomly placed objects. This is tech demo to show that large terrains can be made detailed. Please see our terrain 6, 40km with 3.8 million objects forum topic for additional details and download links. PMC has released PMC Heros Path and PMC Tank Hunter campaigns for PMC Rugen terrain as test versions. These are ported from OFP and need lot of play testing. Check out PMC Rugen campaigns - testing now topic in our forums for details and download. Mon, 08 Aug 2011 11:28:05 +0100 - PMC Rugen v1.3 has been released! PMC has released PMC Rugen v1.3 for ArmA 2! This is first ArmA 2 release of this legendary terrain, it includes all the latest goodies like precise satellite texture according to OFP textures, etc. Watch PMC Rugen video trailer. Check it out from PMC Rugen ArmA 2 release topic at our forum and ArmA 2 PMC Rugen online manual. Enjoy. Mon, 08 Aug 2011 11:24:09 +0100 - PMC Terrain Clutter v1.0 has been released! PMC Terrain Clutter v1.0 has been released! This is terrain clutter which can be used in WRP files (only useful for terrain editors). Purpose of this addon is to provide unified clutter addon for PMC 51km Desert, PMC Rattler and PMC Rugen terrain addons (and in future perhaps others). Check out PMC Terrain Clutter release topic at our forum and PMC Terrain Clutter online manual. Enjoy. We have just updated our ArmA 2 VTE missions pack which is only multiplayer missions. Check them out at ArmA 2 VTE missions page. Enjoy. Mon, 18 Jul 2011 10:11:59 +0100 - PMC Militia Attack missions released! PMC has released two PMC Militia Attack missions for ArmA 2. These are in Takistan on northern and southern airfields, 12 player, base respawn, defense missions against militant insurgents. You can download them from our ArmA 2 missions download page. VTE ArmA 2 screenshots page has been opened! Few screenshots were taken from VTE v1.4 using Take On Helicopters engine where we can get 20km view and object distance. View then at VTE ArmA 2 screenshots page. Mon, 04 Jul 2011 00:22:43 +0100 - Video footage from PMC 10th anniversary MP event! Video footage from PMC 10th anniversary MP event is now available in youtube. Its over one hour of footage, we had fun especially on day 2. I will remember that event for a long time to come. Tue, 28 Jun 2011 14:27:04 +0100 - PMC 51km Desert v1.1 has been released! PMC 51km Desert v1.1 has been released! This is 51km x 51km desert terrain with war torn cities and villages. There is also few modern (intact) cities, three airbases, six oilfields and five harbors. New features are terrain objects separated to their own addon. Tue, 28 Jun 2011 14:26:36 +0100 - PMC Rattler v1.4 has been released! PMC has released PMC Rattler v1.4! Its a 25km desert terrain for ArmA 2. Tue, 28 Jun 2011 14:25:54 +0100 - PMC Terrain Objects v1.0 has been released! PMC Terrain Objects v1.0 has been released! This is terrain objects which can be used in WRP files or placed from mission editor. Purpose of this addon is to provide unified objects addon for PMC 51km Desert and PMC Rattler terrain addons (and in future perhaps others). Tue, 28 Jun 2011 08:48:51 +0100 - PMC Electric Road v1.0 MP mission series released! PMC Electric Road v1.0 multiplayer mission series (campaign) has been released for ArmA 2. 9 COOP missions for 26 players. Check them out from Missions page and read online manual for details. Wed, 22 Jun 2011 05:52:45 +0100 - Vietnam: The Experience v1.4 released! PMC has released Vietnam: The Experience v1.4 for ArmA 2! Tue, 21 Jun 2011 13:38:31 +0100 - PMC 51km Desert v1.0 has been released! PMC 51km Desert v1.0 has been released! This is 51km x 51km desert terrain with war torn cities and villages. There is also few modern (intact) cities, three airbases, six oilfields and five harbors. This is ArmA 2 release and will NOT work in ArmA. Tue, 21 Jun 2011 13:37:48 +0100 - PMC Rattler v1.3 has been released! PMC has released PMC Rattler v1.3! Its a 25km desert terrain for ArmA 2. New features are config errors fixed, new accurate satellite texture, ils (automatic landing) fixed etc. Sun, 19 Jun 2011 14:00:01 +0100 - AGS Port v1.4 has been released! PMC AGS Harbor / Port v1.4 has been released! New features are separated config and signatures with v2 keys. Sun, 19 Jun 2011 14:00:00 +0100 - AGS Roads v1.3 has been released! PMC AGS Roads v1.3 for ArmA 2 has been released! New features are separated config and signatures with v2 keys. Sat, 18 Jun 2011 14:00:01 +0100 - AGS Industrial v1.4 has been released! PMC AGS Industrial v1.4 for ArmA 2 has been released! New features are separated config and signatures with v2 keys. Sat, 18 Jun 2011 14:00:00 +0100 - AGS Buildings v1.4 has been released! PMC has released AGS Buildings v1.4 for ArmA 2! Wed, 11 May 2011 14:00:00 +0100 - PMC Somalia v0.4.1 released! Still very much work in progress, especially Mogadishu city looks not so good. New features are; small tweaks to building objects/textures, soldier models wiggly hands fixed, technicals added, women added... Check out changelog for more details. Sat, 30 Apr 2011 14:00:00 +0100 - Vietnam: The Experience v1.3.10 released! PMC has released Vietnam: The Experience v1.3.10! Some new stuff; floating objects fixes, real shotgun config added, new SEAL and SOG soldier models + textures. Sat, 21 Aug 2010 14:00:00 +0100 - PMC Persistent 1 v0.2 MP mission release! This is our first multiplayer mission release for ArmA 2. PMC Persistent 1 v0.2 is very long 12 player COOP mission on Takistan. Check more detail from our forum topic here. Sun, 15 Aug 2010 14:00:00 +0100 - PMC CAT Afghanistan v1.6 has been released! PMC has released CAT Afghanistan v1.6 terrain for ArmA 2! This is the first ArmA 2 release and will not work with ArmA. Check it out from this topic at our forum and online manual from here. Enjoy. Tue, 10 Aug 2010 14:00:00 +0100 - PMC 51km Desert v0.4 has been released! PMC 51km Desert v0.4 has been released! This is 51km x 51km desert terrain with war torn cities and villages. There is also few modern (intact) cities, three airbases, six oilfields and five harbors. This is the first ArmA 2 release and will NOT work in ArmA. Check out this topic at our forum and online manual from here. Enjoy. Fri, 18 Jun 2010 14:00:01 +0100 - PMC AGS Port v1.3 has been released! PMC AGS Harbor / Port v1.3 for ArmA 2 has been released! This is the very first AGS Port ArmA 2 release. Fri, 18 Jun 2010 14:00:00 +0100 - PMC AGS Industrial v1.3 has been released! PMC AGS Industrial v1.3 for ArmA 2 has been released! This is the very first AGS Industrial ArmA 2 release. Thu, 17 Jun 2010 14:00:00 +0100 - PMC AGS Buildings v1.3 has been released! PMC has released AGS Buildings v1.3 for ArmA 2! This is the very first ArmA 2 release. Sat, 14 Nov 2009 13:00:00 +0000 - VTE ArmA 2 preview has been released! PMC has released Vietnam: The Experience ArmA 2 preview! This is first VTE release for ArmA 2. Tue, 28 Jul 2009 14:00:00 +0100 - PMC Chernarus campaign released! PMC has put out first ever user created campaign for ArmA 2 called PMC Chernarus campaign! Mon, 29 Jun 2009 14:00:00 +0100 - PMC ArmA 2 WRP Demo v1.1 is out! PMC ArmA 2 WRP Demo v1.1 has been released! New version includes extra terrain without buildings. This is technology demo of WRP terrains, its 51km x 51km sized desert terrain with ruined cities. Check it out from this topic at our forum and online manual from here. Enjoy. Sun, 07 Jun 2009 14:00:00 +0100 - PMC ArmA 2 WRP Demo has been released! PMC ArmA 2 WRP Demo has been released! Fri, 05 Jun 2009 14:00:00 +0100 - PMC Apache v1.1 has been released! We have just released first PMC addon for ArmA 2! PMC Apache v1.1 has been released. Check it out from this topic at our forum. Tiscaligames.cz article about ArmA 2 was translated by Deadfast in BIS forums, you can read it here in our forum. BIS announces in armedassault.com that "Game 2" official name will be ArmA 2. Today at Games Convention in Leipzig, Bohemia Interactive announced ArmA 2, its latest military simulation game for PC DVD-ROM and next generation consoles (originally known also as Game 2). ArmA 2 is set in a near future, year 2009, in a fictional post soviet country Chernarus. Players will be sent as members of United States Marine Corpse Force Recon squad to this area to prevent further civilian casaulties and ensure ongoing stability in Chernarus. Arma 2 is based on the latest generation technology, offering large –scale game world, authentic and extremely detailed modern units, weapons, vehicles and enviroments, challenging single player and vast array of multiplayer options. ArmA 2 is expected to be released in 2008. Full game website will be available soon at www.arma2.com. PMC Tactical pages for BIS "Game 2" are now online. We will add content and news as BIS releases something. These pages are merely a placeholders for the far future, for the game we will be playing after ArmA.